The Oriental Stork, Ciconia boyciana is a large, up to 115cm long, white bird with black wing feathers. It is closely related and resembles the European White Stork, of which it was formerly often treated as a subspecies. Unlike the latter species, it has red skin around its eye, a whitish iris and black bill. Its diets consist mainly of fish, frogs and small animals. The Oriental Stork is a solitary bird except during the breeding season. The female lays 2 to 6 eggs and is slightly smaller than male. The young is white with an orange bill. 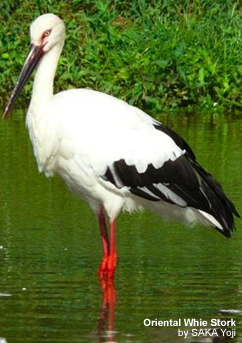 At one time, the Oriental Stork could be found in Japan, China, Korea and Russia. It is now extinct in Japan and South Korea. After breeding, the storks migrate to eastern China in September and returning in March. The scientific name commemorates Robert Henry Boyce. Due to habitat loss and overhunting, the Oriental Stork is classified as Endangered on the IUCN Red List of Threatened Species. It is listed on Appendix I of CITES.